LiveRoof was developed to combine or “hybridize” the best aspects of all types of green roof systems for the best function and best appearance, as well as the most efficient method of installation. Throughout our experience of greening more than 5 million square feet of rooftops, we have continuously improved our shipping methods and installation procedures. In that spirit of continuous improvement, we have developed the following animation focused on “lean” or “continual flow” of materials to help improve installer profitability by emphasizing the importance of avoiding time-stealing processes. Walking, starting and stopping, and having too large of a team increases the number of man-hours required to complete installations. Labor is expensive, so practicing lean flow is essential to being competitive and profitable. Optimum efficiency is achieved with appropriate equipment, “lean” processes, and proper team size. Watch our new video to learn more, or contact us for support in planning your next project. A recent study conducted by a group of researchers has revealed a link between student’s exposure to green space and performance in standardized testing for both English and Math. The study covered a six year time period from 2006-2012 and showed that the more exposure students had to green space the better they performed on tests. The study also revealed that during the peak of the spring growing season this affect was at its greatest. Read the study here. Washington DC — April 27, 2015 — A 4,000 square foot living roof is nearing completion atop The Colonel, a new apartment community in the rapidly transforming Shaw neighborhood of Washington, DC. Riverbend Nursery and MSM Roofing are putting finishing touches on the green roof that will be visible to the general public, as well as apartment residents and restaurant patrons. The Colonel, now more than 50 percent leased and 30 percent occupied, is located at the corner of 9th and N Streets, NW and was developed by a joint venture of CAS Riegler, CityInterests, and Douglas Development Corp. with leasing and management by Oculus Realty. The District of Columbia has policies that encourage installation of vegetative roofs due to their ability to retain stormwater and restore nature to the built environment. 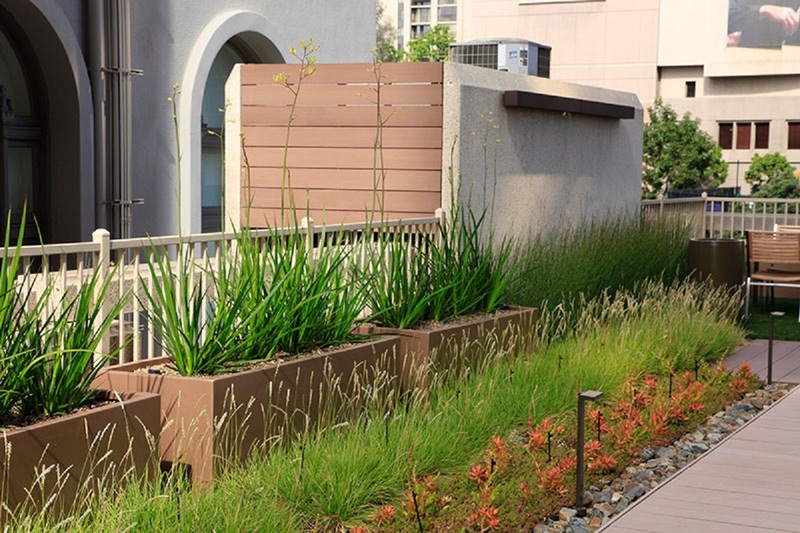 As an alternative to reducing their buildings’ footprints, owners and developers can attain credit toward on-site stormwater management and green space requirements by planting their rooftops. For more information on the aesthetic, environmental, social and financial benefits of green roofs, see Sidebar 1 and Sidebar 2. Named after Civil War colonel Robert Gould Shaw, The Colonel offers 70 luxury apartment homes ranging in size from studios to two-story penthouses, along with extensive amenities including a roof deck with expansive lounge area, fire pit, and kitchen. The Colonel’s street-level retail space has been leased to three exciting restaurants, scheduled to open in late 2015: Espita Mezcaleria, All Purpose, and Buttercream Bakeshop. Please contact: Kelly Ferguson, 617.418.8995, kelly.ferguson[at]riverbendnursery.com or Paul Seal, 540.849.9142, paul.seal[at]riverbendnursery.com. LiveRoof Global, LLC is the horticultural science company that developed the LiveRoof® Hybrid System, whose natural function and natural beauty offer the highest level of green roof performance at the lowest level acquisition-installation-maturation-maintenance costs. Combining the best elements of proven green roof technologies, LiveRoof establishes a seamless vegetative surface rooted in a continuous layer of soil. This design maximizes environmental benefits, energy savings and rooftop aesthetics. Regional growers in its global network adapt LiveRoof plants for local conditions and customize plant selection for every project. The proof is on the roof showcased in LiveRoof projects that stand out as signature elements on commercial, public, university and school buildings throughout the globe. Riverbend Nursery is a progressive container grower of quality perennials, herbs, groundcovers, and ornamental grasses, situated on over 100 acres in Riner, Va. in the beautiful Blue Ridge Mountains,. Riverbend grows more than three million containers annually with over 1,600 varieties, produced in both heated and unheated greenhouses. As a LiveRoof licensed regional grower, Riverbend is committed to providing unsurpassed service to green roof customers in the District of Columbia, North Carolina, Virginia and parts of both Maryland and West Virginia. Since 2006, Riverbend has supplied over 150 living roof projects totaling nearly 650,000 square feet. CAS Riegler Companies is a locally-owned real estate development and investment company that creates unique real estate products in urban infill locations, primarily in the Washington, DC metropolitan area, designed to meet the needs of today’s city dwellers, workers, and retail customers. CityInterests is a fully-integrated real estate firm focused on mixed-use, transit-oriented development. With specific expertise in Washington DC’s emerging neighborhoods, its team of veteran leadership and capable staff bring broad experience in a wide variety of project types — residential, office, retail, hotel, civic and institutional — to maximize value and build thriving communities. Douglas Development Corporation is one of the leading real estate developers in the Washington area, with a national reputation for redevelopment of historic properties. The company’s well-known projects in the East End of Washington have catalyzed redevelopment of the entire area. Douglas Development has a current portfolio of nearly nine million leasable square feet and over eight million SF of developable real estate in the pipeline. Oculus Realty, LLC provides property management and advisory services to private real estate investors in the Washington, DC metropolitan area. The firm specializes in the investment and management of boutique apartment communities and small retail centers. Oculus is a licensed real estate broker in the District of Columbia, Maryland and Virginia and an Accredited Management Organization (AMO®) through the Institute of Real Estate Management. Energy Conservation: On a sunny 95°F day, conventional rooftop surfaces can hit 175°F. By shading and insulating the rooftop, green roofs bring these temperatures in line with the ambient air temperature. They reduce indoor temperatures and energy consumption, especially for air condtioning in summer. This decreases costs for building owners. Reduction in Operating Costs: On average, 13.6 percent for new buildings and 8.5 percent for retrofits. Increase in Building Values: On average, 10.9 percent for new buildings and 6.8 percent for retrofits. The Dublin Community Recreation Center, installed in November 2010, is still green and “saving green” despite the unusually dry summer. A year and a half later, and amidst what is for many one of the driest years in decades, this LiveRoof brand green roof in Dublin, OH is performing great! The Dublin Community Recreation Center is a beautiful, accessible example of successful green roof implementation. The site features a blend of Sedum species for year-round coverage, and rain barrels on the roof collect and store rainwater for irrigating the green roof during dry weather. “We know (green roofs) result in energy savings,” said Michelle Crandall, director of administrative services. This pair of eastern hog-nosed snakes were found hunting toads on the LiveRoof modules at our production facility in West Michigan. Okay, so maybe they’re not actually smiling… LiveRoof, LLC Production Manager Michael Termolen caught this pair of eastern hog-nosed snakes lounging on LiveRoof modules at our production facility. When they spread their necks and hissed at his approach, he quickly snapped a photo of the display and caught one “smiling.” Locally, we refer to them as “puff adders” because they defensively puff up with air and hiss when threatened. According to the Michigan Department of Natural Resources, the hog-nosed snakes are declining in West Michigan, as they are often mistaken as dangerous. Despite their appearances, these snakes are harmless to humans and are more interested in hunting toads than attacking people. You probably won’t find snakes on your green roof… unless it is at ground level… but LiveRoof modules help recreate habitat, typically for winged species that can get to the roof top. Killdeer birds, butterflies, and ladybugs are only a few of the many species that enjoy planted rooftops. One of the visiting “puff adders” slithers away after we interrupted its sunbath on our LiveRoof modules. LiveRoof, LLC is building 30 new Bluebird houses at our West Michigan LiveRoof® production facilities, as part of our commitment to using biological methods as a first line of defense against controlling pest populations. The Eastern Bluebird could have 2-3 families per season and they eat insects such as caterpillars, beetles, crickets, grasshoppers, and spiders. It takes 11–19 days to hatch from the egg and the young will stay in the nest 17–21 days with the parents feeding the nestlings at least twice an hour. That’s a lot of insects! Learn more about the Eastern Bluebird at the Cornell Lab of Ornithology. Instructions to build your own nestboxes can be found at the Northern Prairie Wildlife Research Center. Solar Reflectance, or albedo, refers to the amount of solar radiation reflected off a surface, compared to the amount of radiation absorbed through the surface. A typical black membrane roof absorbs solar radiation during the day as the temperature rises, and then re-radiates the absorbed heat at night as the temperature drops. This absorption cycle results in large temperature fluctuations of the roof membrane and large amounts of heat flow through the building. In the previous Evaporation blog, we referenced a study conducted by the National Research Council of Canada (NRCC) and illustrated the difference between black membrane temperature fluctuation and green roof temperature fluctuation explaining how green roofs help lower ambient air temperature. The degree of a building’s heat flux directly relates to the buildings cooling demand. The figure below illustrates the energy demand of a building due solely to Heat Flow through the roof. Clearly, the green roof significantly reduces energy demands on a building in hot, summer months. This cooling effect is due to evapotranspiration shading, and thermal mass (Thermal mass is a solid or liquid that will absorb and store warmth or coolness until it is needed). During the warmer months, the daily average energy demand on the black membrane roof was 6.0-7.5 kWh/day (20,500-25,600 BTU/day). On the other hand, average energy demand of the green roof building was only 1.5 kWh/day (5,100 BTU/day). That is over a 75% reduction in energy use due to heat flow.